Pearson is getting out of the K-12 curriculum business in the U.S., the global education company announced Friday during a discussion of its 2017 financial results. The company, which had said last May it was exploring the sale, is already in conversations with potential acquirers, according to company officials. 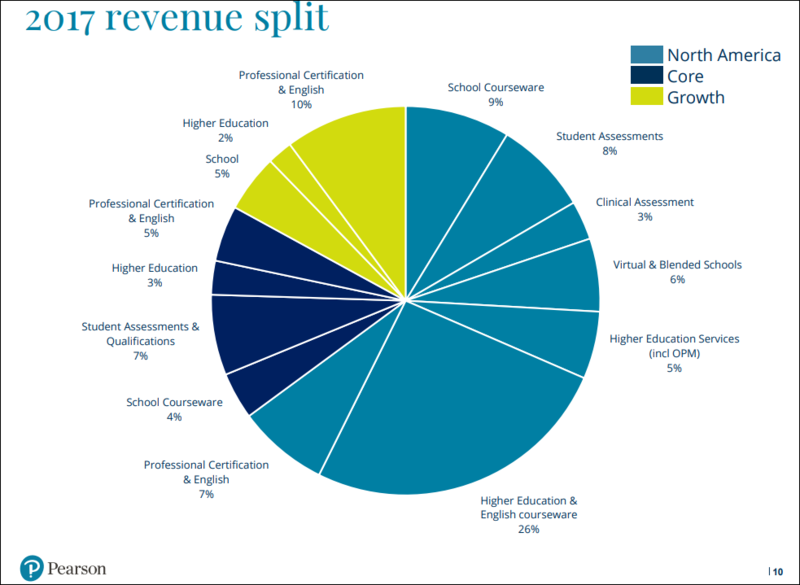 Curriculum products and services were identified as a “lower margin” part of its enterprise, representing about 9 percent of its revenues but returning profits of about 2 percent or £11 million (approximately $15.35 million) last year. The K-12 revenues have been under £400 million or $550 million based on today’s exchange rate. Geographically, Pearson generated about 61 percent of its sales in the U.S. to pre-kindergarten through 12th grade and higher education. At the same time, the company plans to keep its $1.2 billion U.S. assessment business, which grew 7 percent in number of digital tests administered last year. Pearson said it is the market leader in this segment, with a share of greater than 35 percent share. The company is expecting stabilization in student assessment in the U.S., according to Coram Williams, the company’s chief financial officer. Next month, the company plans to publish the first of its “fully audited efficacy reports” into a series of key products, the company said. Details of its PreK-12 efficacy research thus far are available on its site. The distribution of various portions of the company’s revenues is represented in the chart below. The K-12 curriculum business, which is called Pearson Learning Services, offers thousands of titles across dozens of programs in math, literacy, science, social studies, world languages, music, and intervention, according to the company. Pearson reported a revenue decline in the “high single digits” last year in U.S. sales of curriculum products due primarily, the company said, to “sharp declines across open territory states in the second half of the year.” In open territory states, schools and districts can make their own choices about what to buy. In adoption states, the state makes selections and schools choose off of a list. This revenue decline was “partially offset” by growth from adoption states. Pearson indicated that it had “strong performance” in Spanish for grades K-12 in Texas, K-12 science in Indiana, and science for grades 6 to 8 in South Carolina. Overall, the company’s new adoption participation rate fell from 64 percent in 2016 to 61 percent last year. It won a 38 percent share of adoptions competed for in 2017, compared to 30 percent the year before, and 29 percent of $365 million total new adoption expenditure, compared to 9 percent of $470 million in 2016. Pearson chose last year not to compete in California’s K-8 English/language arts adoption process. Pearson’s assessment sales in the U.S. and the U.K. account for about 16 percent of the company’s revenues, according to John Fallon, chief executive of Pearson. My colleague Sean Cavanagh reported last week on the latest developments in Pearson’s ongoing dispute of Iowa’s award of a $31 million state testing contract to the American Institutes of Research. In school assessments, revenues declined “in the high single digits” because of contract losses, the company said. Last June, Colorado announced that it would be leaving the PARCC consortium after the 2017-’18 school year. Pearson won the subsequent bid to deliver English language arts, math, science, and social studies assessments for the next six years in the state. The company said it has also “secured contract extensions in Virginia, Indiana, Arizona, Minnesota, Puerto Rico, Kentucky, New York City and North Carolina,” and for the National Assessment of Educational Progress. Pearson delivered 25.3 million standardized online tests to K-12 students, an increase of 7 percent from 2016. Conversely, paper-based standardized test volumes fell 7 percent to 20.4 million. In the U.S. and the U.K., Pearson is working on the adoption of artificial intelligence in assessment “to support better learning providing real-time personalized feedback,” he said. The company is also using artificial intelligence scoring systems, which it said have scored 35 million responses to open-ended test items—around 30 percent of the total. Virtual Education: Another Avenue for Growth? Two of the biggest structural growth opportunities for Pearson, Fallon said, are partnering with charter boards to run virtual schools, and partnering with universities to provide fully online degrees. “Both markets are relatively earlier in their development,” he said. In the U.S., virtual schools represent a $1.5 billion market across 34 authorized states, and Pearson has a .7 percent penetration with Connections Education, making it the second largest virtual education provider behind K12, Inc. Last year, Connections experienced a 6 percent growth in full-time equivalent student enrollment. Fallon acknowledged that the company has seen “some shifts in contracts,” where some of the early adopters have chosen to bring the development of their online education in-house. “We’re learning from that,” he said. This blog post has been updated with information about how many products are part of the curriculum sale. Very much a business move based on the ability to make a profit. With the emphasis on charter and virtual from Secretary DeVos and the popularity of standardized testing, the assessment sector will be a very profitable for the foreseeable future. However, even though they will not be selling curriculum related items, the assessment people are going have to keep tabs on what is going with curriculum in order to produce relevant testing materials. As a secondary educator, I question this move on the surface. However, it creates an opportunity for others in the curriculum sector to take advantage of. I’d love for this to be their move and then for testing to become a smaller part of our focus. If we spent as much money on education as we do on testing with Pearson, we might have a more educated public. Pearson is correct that eventually virtual programs will begin to hold a larger segment in education. A focus that direction will pay off; however, I would be pleased to see that guided by other organizations vested in teaching and learning over assessment that fails to actually measure learning. Our students need to learn rather than learn to test. Industry and career certifications are now focused on test results over knowledge. There are many ways to determine competence with subject matter and skill levels. Good riddance to bad rubbish. Pearson has tried to monopolize the K-12 education market. How refreshing to see them turning tail and running away.